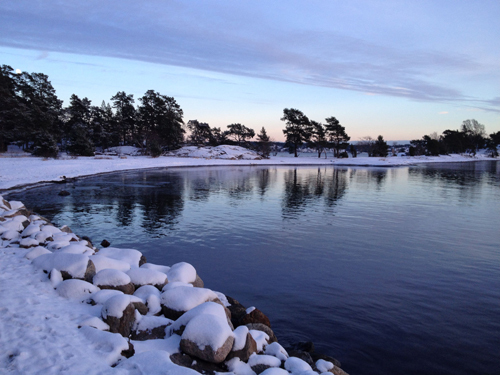 When our train pulled up to the station in Ronde, Denmark we stepped out to a fresh layer of snow and a strong breeze. 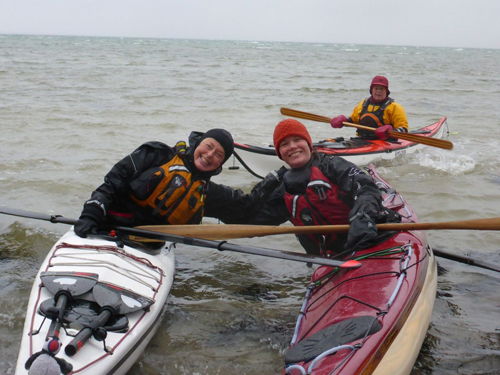 We were here for the DGI Sea Kayak Winter Festival, a symposium for kayak instructors. This was our first year at the event, and we were thrilled to not only be there, but to be there in the winter. Michael Sorensen organized the event, and guest instructors were Jeff Allen, Trenk Muller, Mark and myself. The forecast for the weekend was for snow, rain and strong wind. This being a winter festival however, we were prepared to get creative to minimize exposure to the elements. 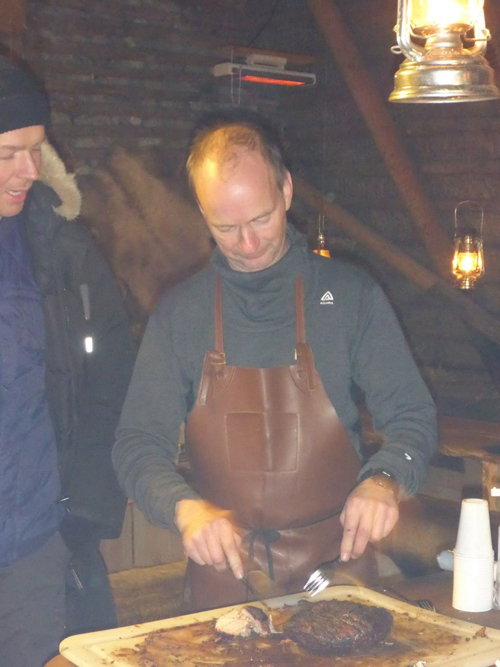 Participants arrived at the fantastic event headquarters, Lergravgaard & Brugnaturen, on Friday evening for a wonderful dinner and social gathering. On Saturday morning I ran Yoga for Paddlers, and was impressed that 16 people dragged themselves out of bed early to participate. 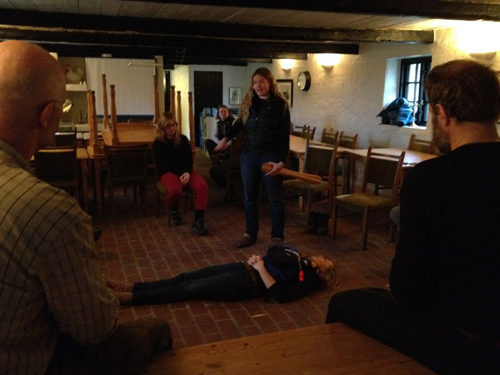 Several people were there to take a weekend-long first aid and CPR program. Those that were left split into two groups. Jeff took one group for a towing class. The second group split in half, with me instructing how to teach rolling, and Mark and Trenk teaching paddling technique. In the afternoon I traded groups with Mark and Trenk, and the following day, we switched groups with Jeff. This was a great format, because it meant that everyone had the opportunity to participate in all of the classes. Mark and Trenk take their group to the water. Wind provided a great learning environment. Everyone seemed to be having a great time. 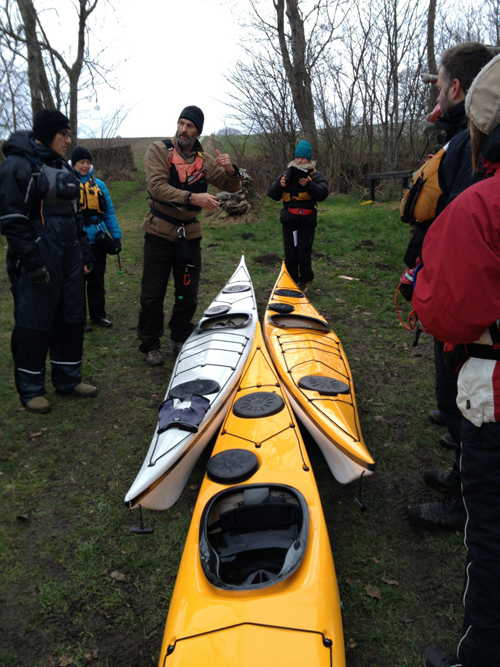 Jeff talks about the many ways to tow a kayak. My class stayed indoors and worked on the fundamentals of teaching rolling. As much as this event was for instruction, it was also a fantastic social gathering. 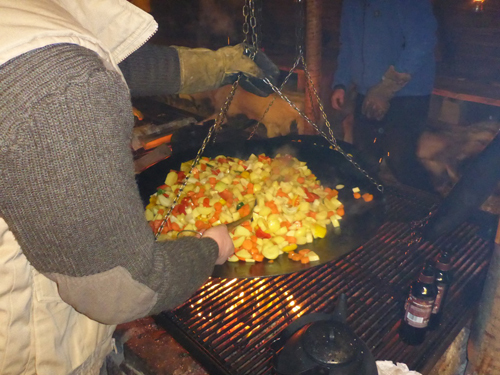 This was clear Saturday night when we had a communal dinner cooked over open flames in the Viking Banquet Hall. The veggies were not only tasty, but colorful as well. 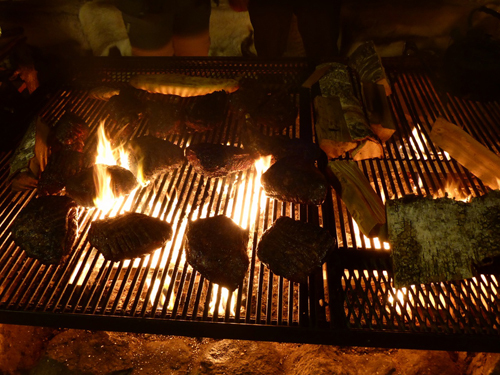 There were lots of choices for both meat and veggie lovers. Michael did a fantastic job of keeping everyone fed. 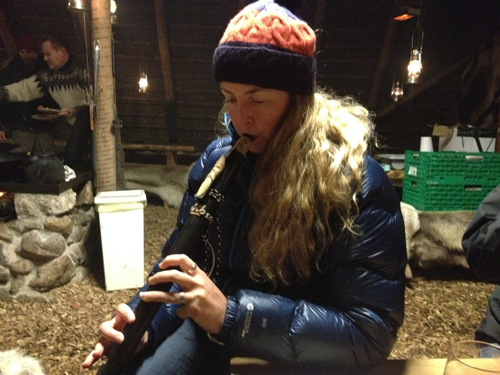 I had a chance to play Jeff’s Native American flute. 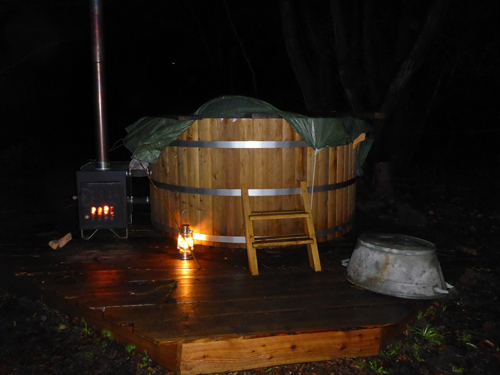 For those that were up long enough, a wood burning hot tub awaited. Thanks to Michael for taking such good care of us. We had a wonderful time! Pictures by Trenk Muller and Mark Tozer. 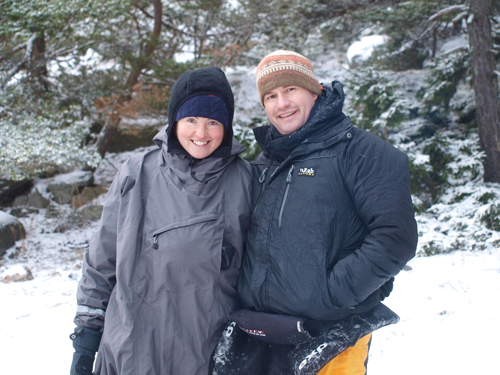 For the past few summers Mark and I have traveled to Scandinavia to teach classes in the Nordic countries. We’ve witnessed people sunbathing on warm rocks, kids dressed in shorts and tank tops enjoying ice cream on park benches and have chatted with friends during barbecues long into sunlit nights. 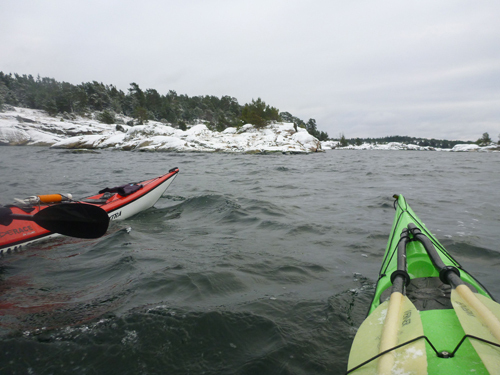 We’ve heard stories about winter in Sweden, how the sea transforms into an ice field, kayaks are replaced by ice skates and how the rock gardens that we usually paddle around become passages only accessible by foot. 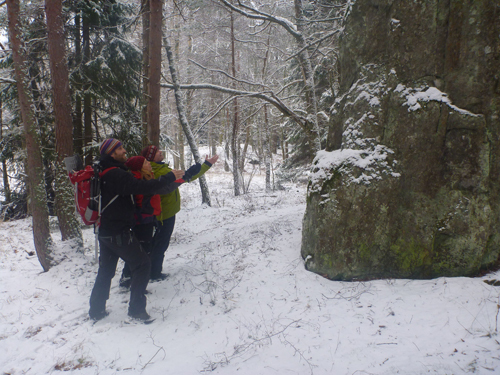 When Pelle and Carina of Nynas Kajaks invited us to visit, Mark and I were thrilled to go. 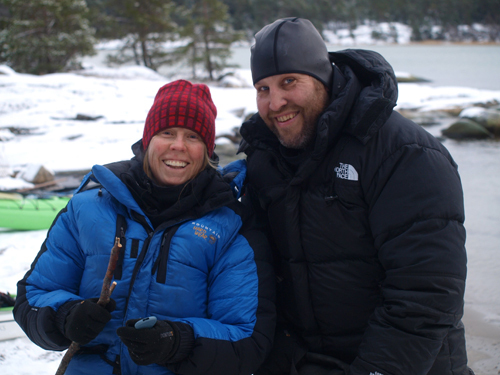 We had a very busy 2013 and decided that a vacation with friends during the “off-season” for kayak instructors was just what we needed, and experiencing a Nordic winter sounded like a blast. 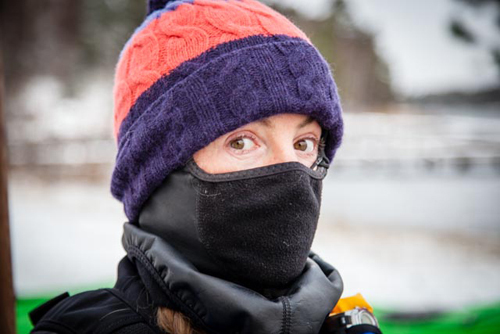 As luck would have it, Sweden was having an unusually warm winter, with rain and fog replacing the usual ice and snow. It was still good to be there though, and Pelle, Carina, Mark and I took advantage of the chance to explore both the land and the water. A foggy day on the water. 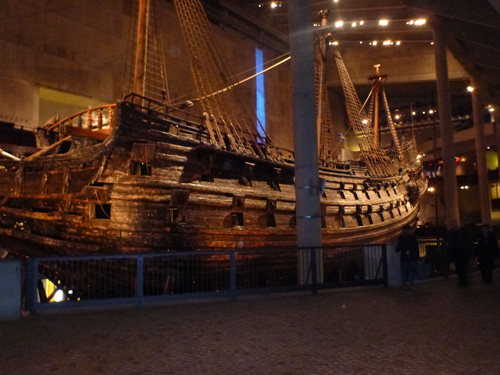 A very impressive ship called the Vasa, which sank during its maiden voyage in 1628. One morning we awoke to winter. The transformation was amazing, and where there had been grass the night before, there was now a thick layer of snow. 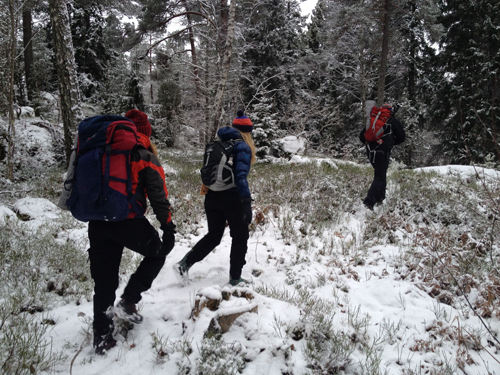 A snowy hike in Nynashamn. 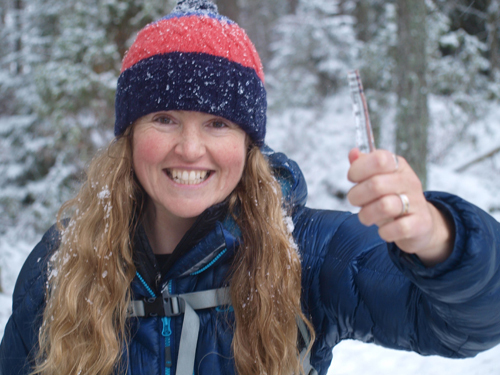 A day in the snow brings out the playful nature in everyone. 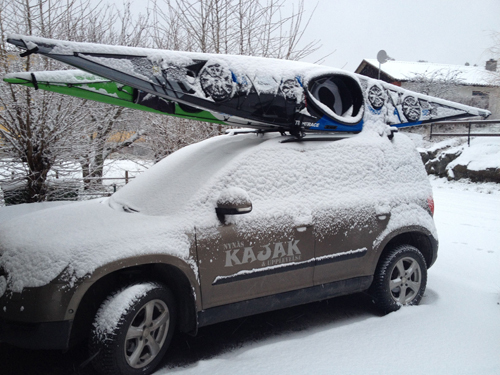 Snow and kayaks are a great combination. 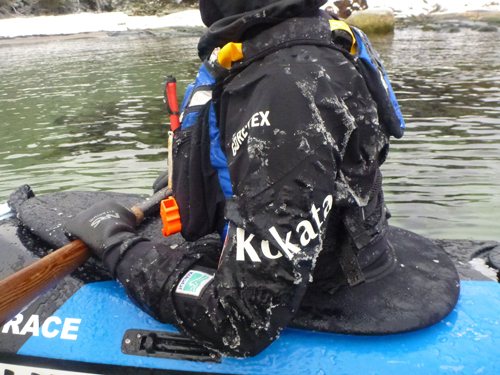 Warm clothes are necessary for a day on the water. 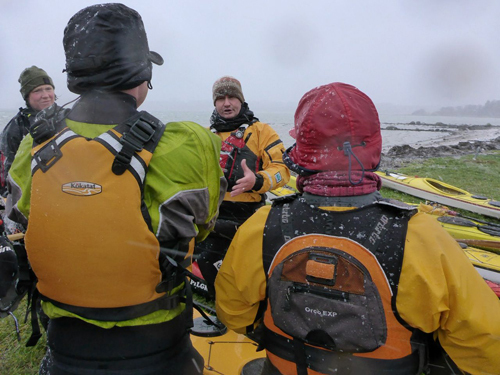 Paddling around snow and ice covered rocks was a magical experience. We built a fire on the beach to cook lunch over. Mark and I enjoying the day. Pelle and Carina were awesome hosts! 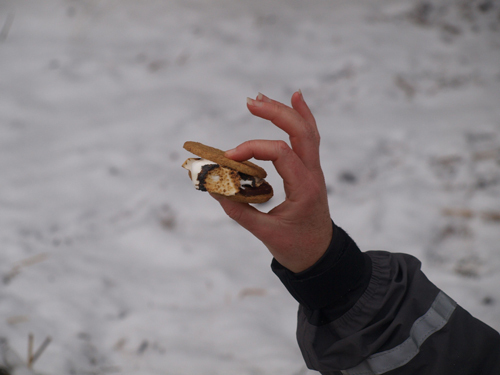 S’mores were a fun treat. 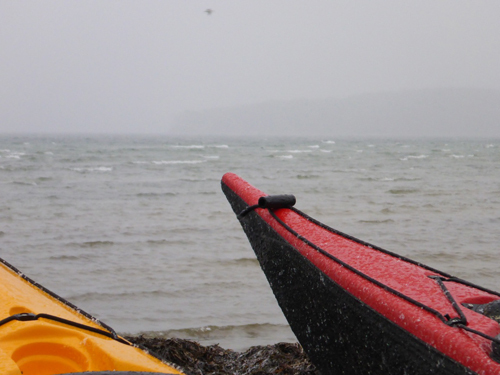 Icy air and wind chill contributed to frozen kayaks and gear. 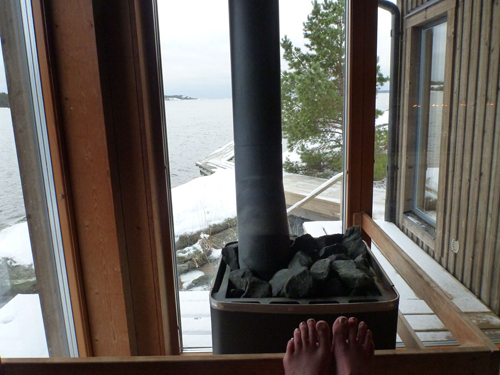 After one paddle, Mark and I headed to a spa to sit in hot tubs, saunas and steam rooms while enjoying the icy view. 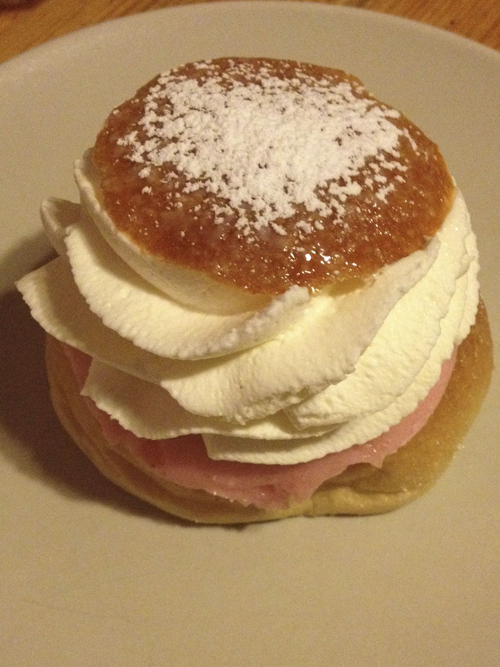 Eating a semla is another way to warm up. 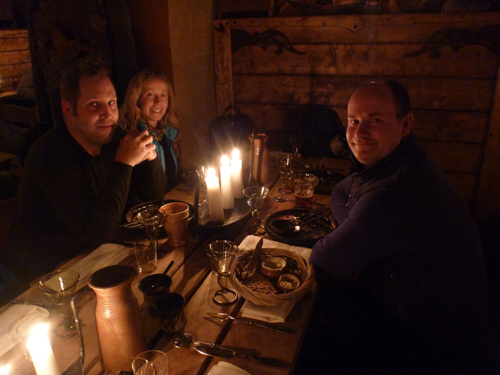 We enjoyed an evening in Stockholm at a fantastic Viking restaurant called Aifur. 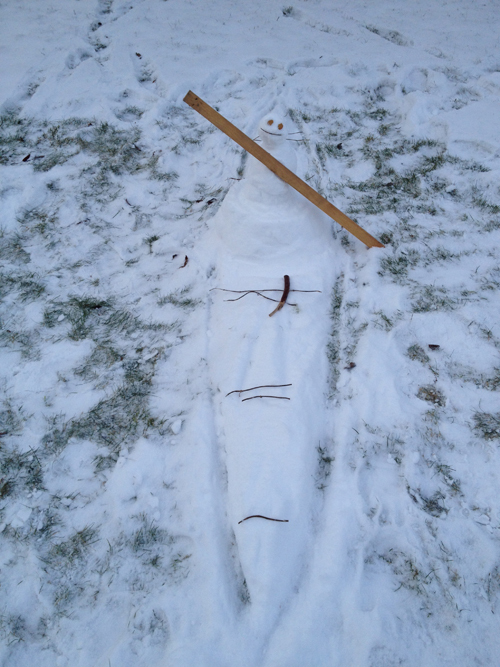 Mark and I spent our last afternoon in Sweden building a snowman, complete with a kayak, a paddle and a norsaq. 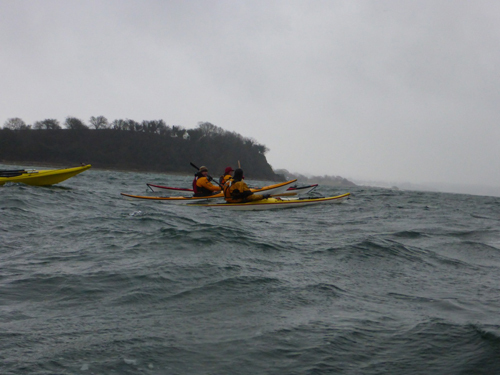 We’re now on our way to Denmark, for the DGI Sea Kayak Winter Festival. Thanks Pelle and Carina for a great vacation! Pictures by Pelle Hammarstrom, Mark and Helen.